A fire extinguisher agent that leaves no residue after a discharge. Preferred method of fire suppression in a sensitive environment like computer rooms and data storage. Paint Booths and other applications will use Dry Chemical Fire Suppression Systems. 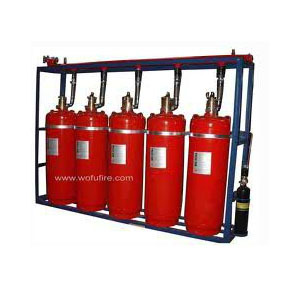 Carbon dioxide systems are fixed where Co2 cylinders are permanently in place and connected to a series of piping. These systems are typically found in unoccupied areas like switchgear and transformer rooms, battery rooms etc. These systems work by depleting the oxygen content in a room below the necessary levels to provide combustion. However, at this level of oxygen life cannot be supported. Composed of a mixture of 3 naturally occurring gases, carbon dioxide (8%), argon (40%) and nitrogen (52%).